Was totally set to blog on this yesterday (very excited! 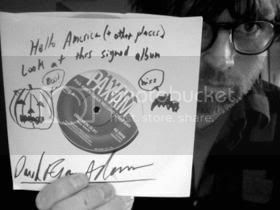 ), but I twittered instead... Annnyways, Ryan Adams update. Ryan revived Pax-Am records with the welcome news of a new single that wasn't joke metal or conscience(less) rap, and then for Halloween released another: PAXAM 005 release "OBLIVION" b/w "People Need Sunlight," the first of which was recorded "right before Easy Tiger came out right before I quit getting wasted. Those were wild and crazy times indeed and I have always loved this track. You can almost taste the pollution in my mouth." It's out on pink vinyl, but it's already sold out! While you're waiting for the digial release, or if you just missed the lighter side of D.R. Adams, have a listen to "Jimmy Whistlenut," which is the pretty, epic ballad of Jimmy Whistlenut's sax blowing wife, trouser licking dog, penchant for tripping on Robitussin and crack, time machine, break dancing, and jumping jacks. Not a non-non sequitur in the bunch, so you know it's good.